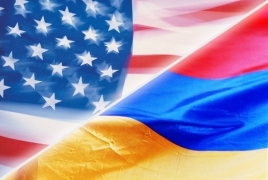 PanARMENIAN.Net - Executive Vice President of the U.S. government’s Overseas Private Investment Corporation (OPIC) David Bohigian and other U.S. government officials traveled to Yerevan to promote U.S. investment in Armenia. The delegation met with senior government officials, business leaders from U.S.-based companies, and beneficiaries of OPIC support. This is the first stop on a trip to the Caucasus to promote U.S. investment in the region, strengthen partnerships, and find opportunities to deepen business ties that drive economic growth and stability. On Tuesday, August 14, the U.S. delegation met with Armenian Minister of Economic Development and Investments Artsvik Minasyan. Bohigian also delivered remarks at the Armenian launch of the Gazelle Fund, an OPIC-supported investment fund that provides growth capital to commercially viable small and medium enterprises, especially in agriculture and light industries. Drawing on reflows from a lending program originally funded by USAID, the Gazelle Fund bridges the gap between small and growing enterprises – known as gazelles – and the financing they need to expand. With the Gazelle Fund, companies can use low-collateral loans and equity to catalyze private sector growth and expand private sector employment. In addition to Armenia, the Gazelle Fund also serves Georgia, Kyrgyzstan, and Moldova. Since its establishment in 1974, OPIC has committed $88 million in finance and insurance across 14 projects in Armenia, covering a range of sectors, including tourism and financial services. It currently has almost $168 million invested in the Caucasus. While in Yerevan, Bohigian also met with board members of the American Chamber of Commerce, the Innovative Solutions and Technologies Center (a public-private partnership between USAID and IBM), and clients of First Mortgage Company, which through OPIC support was able to provide mortgages to middle- and low-income borrowers. OPIC is the U.S. government’s development finance institution. As part of his National Security Strategy, President Trump highlighted the need for a modernized approach by the U.S. government to development finance to help grow aspiring partners, promote economic relationships, and increase investment in regions important to American interests.